I inherited my love of gardening from mother and grandmother. 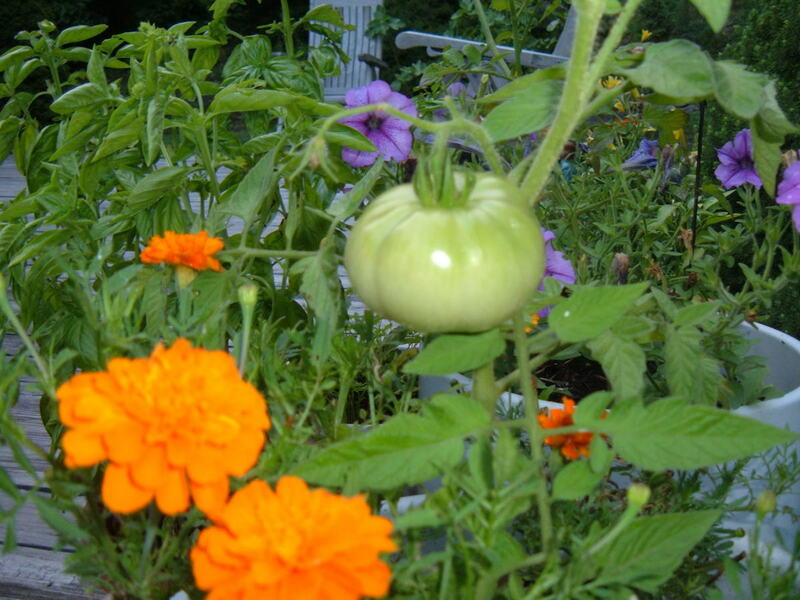 I am a garden blogger, freelance writer, and Master Gardener emeritus. Carrots are inexpensive and plentiful. Why bother growing them? They are buried treasure, sweeter than you know. Having plenty of them will encourage you to try more recipes than just the famed carrot cake recipe with cream cheese frosting. There are five major categories of carrots. Ball-type, Chantenay, and Danvers carrots have blocky shapes that can handle heavier or shallow soil. Nantes and Imperator carrots require very deep, loose soil. Choose the carrot variety based on your climate and soil. You may be able to get two crops a season. Soil is the most important factor in growing long straight carrots. Before planting, devote some time to preparing the soil. Double-dig your planting area or build up a raised bed. Remove rocks and amend the soil. Work in peat moss or core, adding plenty of light organic matter. Carrots are considered a cool season crop. Don't plant all your carrots at once. 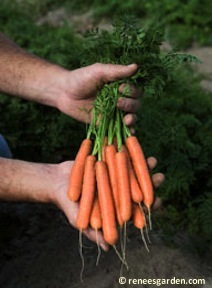 To have an extended harvest of fresh carrots, plant some now and in two weeks plant more. 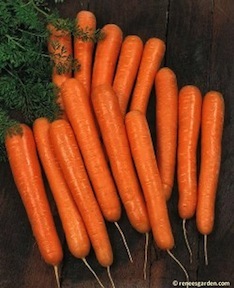 Most carrot varieties require 70 to 80 days to mature. Plant spring carrots two or three weeks before last frost date. Plant more in two weeks and again two weeks later. Plant seed in rows or broadcast the seed. Include a few radishes with the carrots as plant markers. Then, be patient, it will take 1 to 3 weeks to sprout. Seed germinates faster in soil. Rake the soil free of lumps and stones. Broadcast the tiny seeds, or for easier weeding, plant in rows. Put a pinch of about six seeds to the inch. They will take 1 to 3 weeks to sprout (they germinate more slowly in cold soil than in warm), so mix in a few quick-growing radish seeds to mark the rows. Cover with ¼ inch of screened compost, potting mix, or sand—a little more in warm, dry areas—to make it easier for the delicate seedlings to emerge. Water gently to avoid washing seeds away. Keep the soil continuously moist for best germination. Consider simply sprinkling seeds on top of the soil then gently dust with a ¼ layer of core, peat or fine topsoil. Firm soil with the palm of your hand. When the carrots are up and growing for two weeks, thin carrots to one inch apart. Two weeks later, thin again, leaving the carrots 3 inches apart. Thin to 1 inch apart when the tops are 2 inches high, crowded carrots will produce crooked roots. Mulch lightly. Thin again 2 weeks later, spacing carrots 3 to 4 inches apart. Add more mulch. Continue to weed and mulch, disturbing the carrots as little as possible. Carrots naturally push up through the soil as they mature. Prevent carrots from becoming green and bitter by mulching. Mulch will deter weeds and keep the soil moist. Carrots get more color and flavor as they mature. Harvest as needed or pull all the carrots at once for a single harvest. Carrots bruise easily, pull the carrots by hand. The day before harvest, water the carrot bed. The moisture softens the soil and makes pulling easier. Store fall carrot crop right in the garden by mulching the bed with several inches of dry leaves or straw. Ever seen a carrot flower? 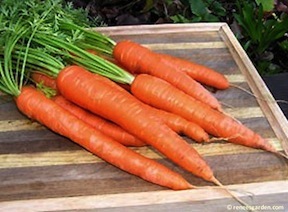 Carrots and their relatives: celery, fennel, parsley, parsnip, dill, and caraway are members of the Umbelliferae family. So named for the umbrella shaped flowers. Carrots are biennial plants. 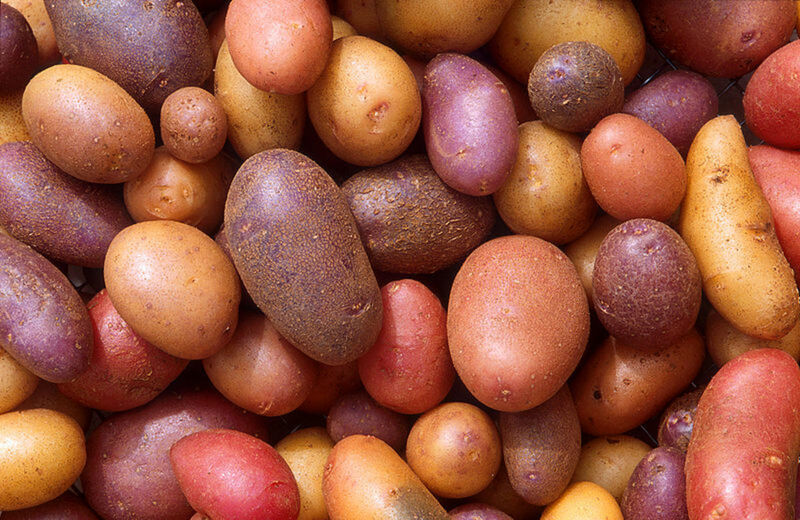 If you leave them in the ground, the tops will flower and produce seeds the second year. This cubic foot of soil warms faster in spring. It drains quickly in wet weather. Set the mini raised bed on top of your full sized raised beds creating an extra deep garden space for carrots. Build a mini raised bed to grow long, straight carrots. Amend the garden soil with organic matter or compost. 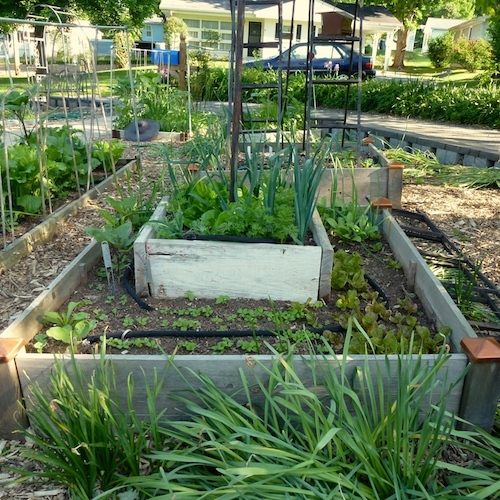 Top with a square foot raised bed. Fill with screened garden soil or potting soil blended half and half with moistened core or peat moss. Sow seed two or three weeks before the last frost date. 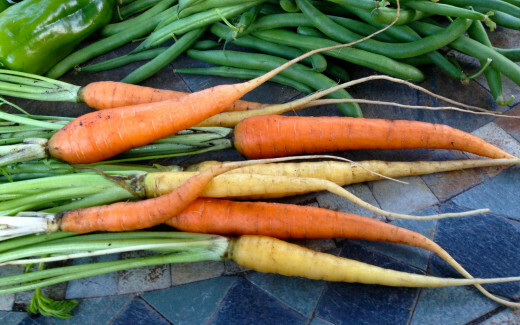 With a jump on spring and an extension in fall, it's easy to grow two carrot crops a year. Add soil to the top and water. Thinly sow carrot seed and cover with a ¼” of the soil mix. Gently firm the soil. Keep the soil moist but not wet. Build a mini raised bed. This wooden box has four sides and no top or bottom. One four foot length of 1 x 10”. Cut into four 1' lengths. Piece the sides together using two wood screws per side. This is a great way to recycle unused scrap lumber. 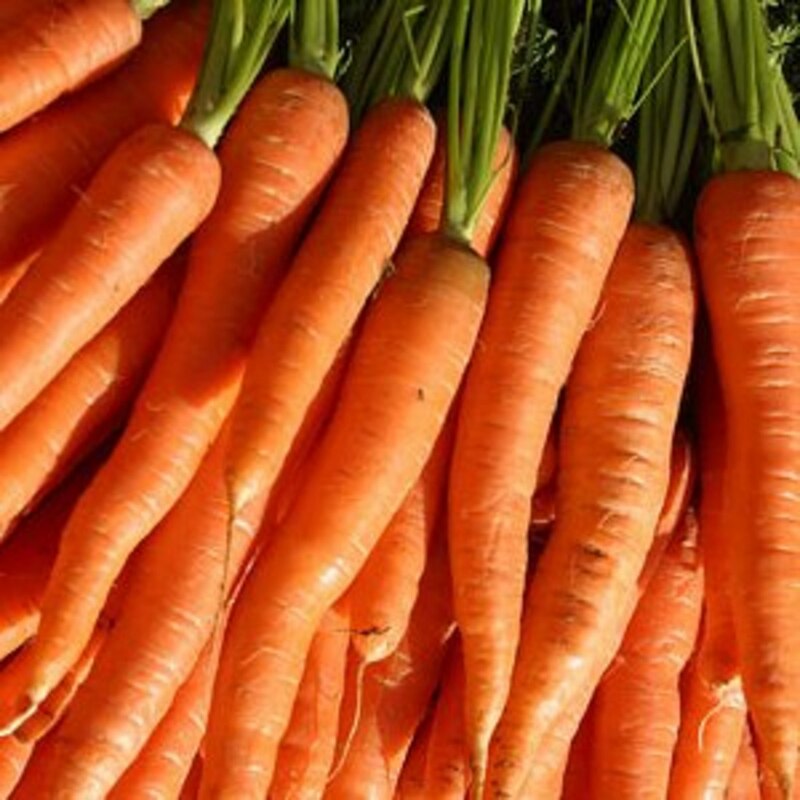 Splurge on a fine, light soilless growing mix for beautiful straight carrots. I am sorry you don't have the space to garden. Perhaps some more folks will be able to grow a few carrots (or beets, parsnips, deep rooted herbs) in this square foot carrot box. I'll be rooting for you. Thanks for reading and commenting. I only wish I could grow carrots like this. Our yard is limited right now. Thanks for the growing tips. Thank you, Soraya Y. You can grow two crops a year where you live. I appreciate you kind words. beautiful article ! It has every single detail for the growing of carrots. You will have your best success at sweet carrots, growing them when mature carrots get a bit of frost in the fall. I am so grateful to have met you. Thanks for your kind words. You made my day. Excellent article here all about carrots! Very useful with great instructions. Thank you. You made my day. MsDora, it looks like you live in a garden paradise. What will you grow this year? Thank you! I've never had much luck with carrots until I started focusing on the soil. Will you try growing carrots this year? Another great informtional nd instructionl article. Thanks for introducing the different types of carrots. Voted Up!